Posh striker Joe Gormley in action against Ipswich. Photo: Joe Dent/theposh.com. Peterborough United manager Dave Robertson praised his side’s defensive work following a hard-fought 0-0 friendly with Championship side Ipswich at the ABAX Stadium today (July 25). 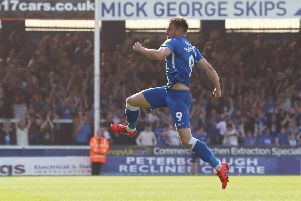 It’s all been about the strikers during a free-scoring run of form in pre-season, but Posh showed another side of their game that pleased Robertson today. Posh winger Marcus Maddison in action against Ipswich. Photo: Joe Dent/theposh.com. Centre-backs Gaby Zakuani and Ricardo Santos were impressive against a side expected to challenge for promotion to the Premier League next season. Santos limped out of the game with a toe injury, but it’s not thought to be too serious. Posh remain unbeaten this summer with four wins and two draws from six friendlies. This was the first time they had failed to score. “I knew when I took over that I could make this team hard to beat,” Robertson stated. “I knew we had defenders at the club who could defend strongly and keep clean sheets and Gaby and Ricardo were very good today. “I took Ricardo off as a precaution more than anything because I want him fit to play against Rochdale on the first day of the League One season. “I don’t normally like 0-0 draws, but this was a decent effort against a side who reached the Championship play-offs last season and who will challenge for promotion again this season. “They are a very strong side. They are where we want to be in 18 months time, but we came through another stiff test very well. “We could have shown a bit more attacking flair and the service to the front men wasn’t great at times, but generally we acquitted ourselves well. Posh travel to Grimsby for another friendly on Tuesday (July 28) when a younger, less experienced side is expected to be selected, before hosting Cambridge in the Chris Turner Memorial match at the ABAX Stadium on August 1.